1Arquitecto, Pontificia Universidad Católica de Chile, Santiago, Chile. 2Arquitecto, Pontificia Universidad Católica de Chile, Santiago, Chile. 3Profesora, Facultad de Arquitectura, Arte y Diseño Universidad San Sebastián, Santiago, Chile. In recent years, it has become common to talk about cultural infrastructure as if physical spaces were only a helpful supplement to the manifestations that take place in them. 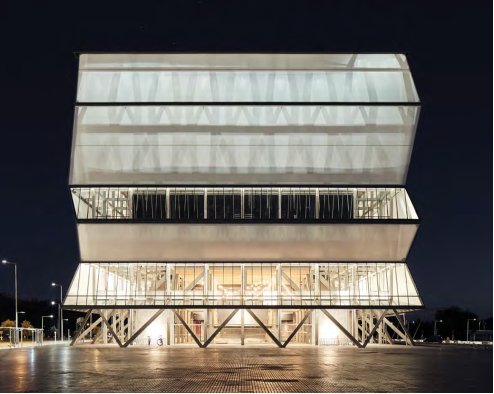 But, as this project shows, architecture is much more than a framework for culture. It is, rather, a cultural manifestation in itself: an object that not only contributes to material culture, but also structures an idea of urban culture. 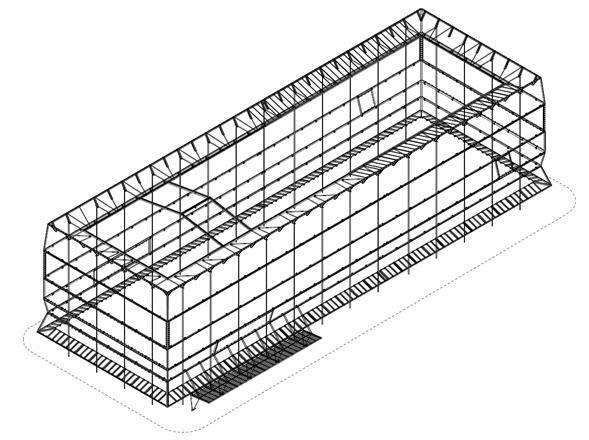 Our project for the Biobío Regional Theater is the possible skeleton of a wrapped theater. Inside, the viewer will move/climb in a spatial grid that stubbornly appears to be measuring/occupying each of its corners. 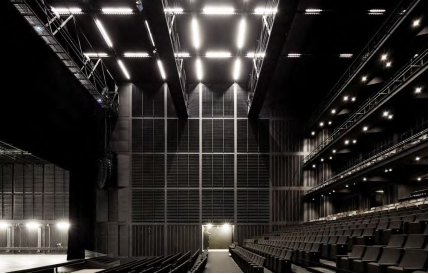 It is in the auditoriums where the grid loses saturation bringing back the air necessary for the performance; a black air, a gloom of diffuse limits. 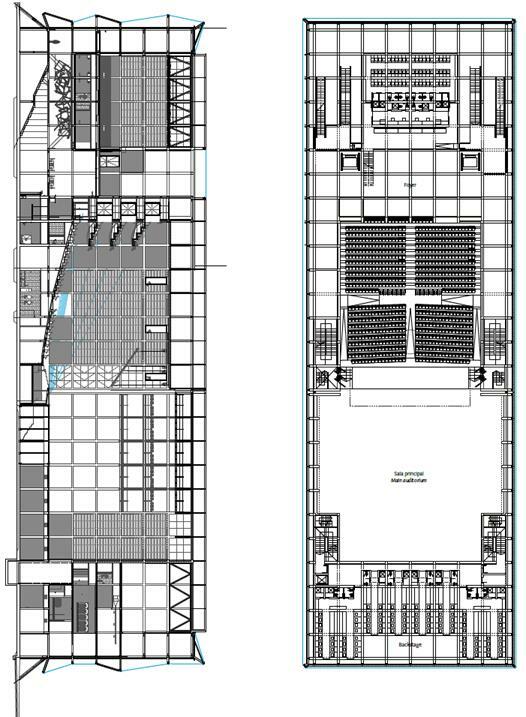 All the ‘paraphernalia’ around the auditoriums - understood as open fields within this 3.90 m structural grid - is simply scaffolding, as if it were the backside of a stage set, the low-range support that is usually hidden and remains unnoticed. Thus, the viewer should not expect to go through the lobby and access the darkness of the auditorium to ‘open’ the theater: the mystery appears before entering. It is enough for the walker/spectator to see the cloak that falls over the building, veiling it, to sense - or ‘anticipate’ as Kantor says - that something is hidden inside, or at least to believe for a moment that to circulate inside it is part of an experimental process. The performer, on the other hand, has a flexible air at his/her disposal. 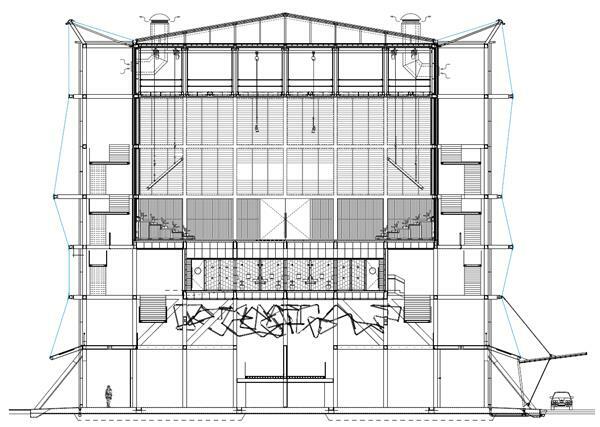 The auditoriums have acquired contemporary dimensions and, with some basic mechanical instruments, the optimal technical qualities required by the versatility of the place are served. Please do not expect going to the theater to find a pompous staircase or a majestic hall to welcome you. If you intend to access from the front you will find yourself under the staircase and next to a fire extinguisher. The coconut fiber with which you shook your shoes upon entering will reappear hanging on the ceiling. When you try to look out through the side window (one of the few exterior openings) you will notice beside you the fire hose reel. Everything is in plain sight, bare, unlike how we usually understand it. It is the anti-theater. A building full of contradictions questioning and expanding the action scope of the discipline. A striking contradiction is the Theater’s day-night image. If at night it is transfigured and its skin seems complex, rich and light, during the day, on the other hand, it looks like an opaque, sparse, strange object. A weird kind of circus.4 For the competition, the project was introduced in its night form, a deliberate strategy from the beginning. If there is a show inside, there is also a light show for the city. 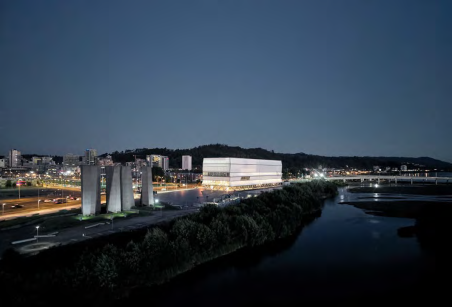 The lighting design textures the membrane with nuances, insinuating its structure and the stage boxes - as if it were a shadow theater - and in fact, it works as a lamp recognizable from the other side of the river. We would say that it is a building designed for the night rather than for daytime. Discontent becomes fiercer in its daytime presence.5 However, it has been little noticed that in that area of the city is frequently foggy in the morning, especially in winter. It is then when the Theater - we return to the pale membrane - mysteriously merges with the site and resembles a ghost. This fog suggests that of Sant’Andrea in Mantua or that of Lewerentz’s East Cemetery in Malmö, an unattended architectural resource that architectural photographers should register. A conceptual contradiction is the material combination of membrane and glass, a difficult and uncomfortable dialogue as one tends to opacity and the other to transparency. But it was excessive to envelop the entire construction in membrane. 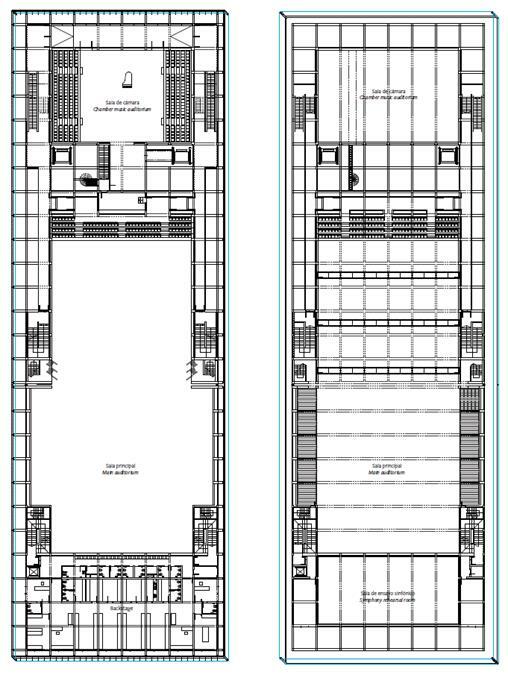 The openings on the long façades, towards the river and towards the city, are reduced to a minimum, two per side, and the visitor wonders why he cannot enjoy greater views of the river from the access hall to the auditoriums. The moment in which Radić’s private research (obsessions) with tents - developed by the architect in the cr House or in the San Miguel Room - assume giant and public dimensions, these become cause of citizen debate. The unusual dimensions of this white polytetrafluoroethylene (PTFE) perimeter membrane - a major technical requirement for architects - activate many sensations. Using it as envelope calls for a particular experience while circulating in the space of the hall, as you perceive the murmur of the wind, the rain rattle, the external noise.6 With sunsets, the fabric adopts different shades of orange that harmonizes with the coconut fiber coating and Iván Navarro’s light installation. After this bath of light and sound, the silent black air inside the auditoriums awaits us. 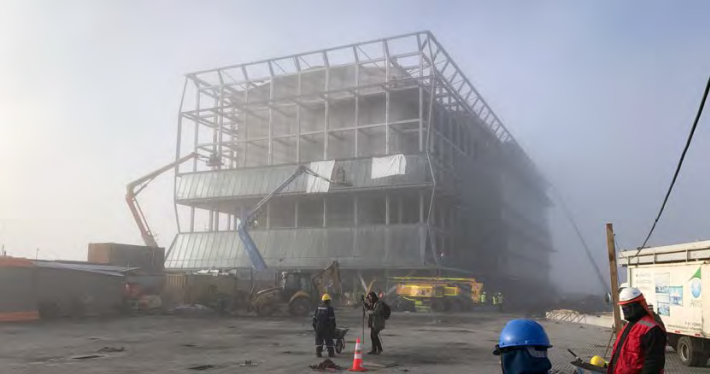 The use of this membrane expands the technical and intellectual boundaries of architecture as Siegfried Ebeling once wanted (Ebeling, 2015 (1926):78). The space as membrane: an intellectualization perhaps incomprehensible to the audience. 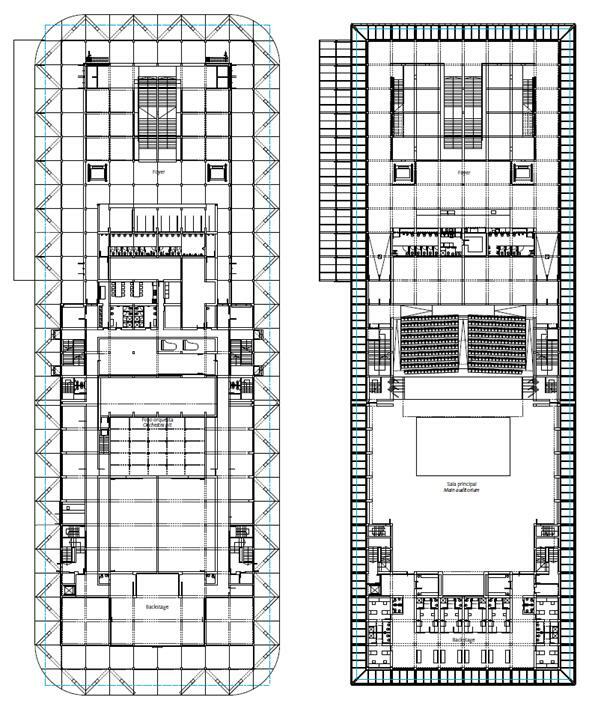 Clearer features are the quality of the auditoriums, sober, elegant, and well equipped; the austerity and eloquence of the few materials used, for example, large wall surfaces covered with red and black mosaics echoing the ceramics characteristic of Concepción’s modern architecture; and a modest budget for infrastructure this size (Bernstein, 2018). Another evident contradiction, imposed by the rules of the competition, is to locate a public infrastructure in a place, albeit extraordinary, still largely disjointed. The pedestrian disconnection with the city makes the most comfortable and typical arrival by vehicle through a motorway, which means approaching the main access from behind - without any charm. It is unfortunate that there are parking lots between the building and the river, although the public space and the exterior life around the theater could be activated if the city does its homework: covering the railway and linking the center with this historically forgotten area. In fact, the importance and repercussion of the Theater is the opportunity that Concepción has to articulate a great urban project. Meanwhile, it will remain a rather inhospitable place. And in spite of everything, this equipment is a luxury for the city, for the country, for architecture.